You can count the increments of growth after the wound (w). Remember each year a new tree grows around the old tree. This wound occurred 6 growth increments ago or we say this tree has a 6 year year old wound. Notice there was no healing. Just new growth after the wound is new spatial positions. The wound was compartmentalized and not healed. What resist the succession of microorganisms, into the wood formed after the wound, in sections marked 1-6 is wall 4. Don't forget some of these words can be found in the Techno Tree Biology Dictionary. Click here and look up "Barrier Zone". 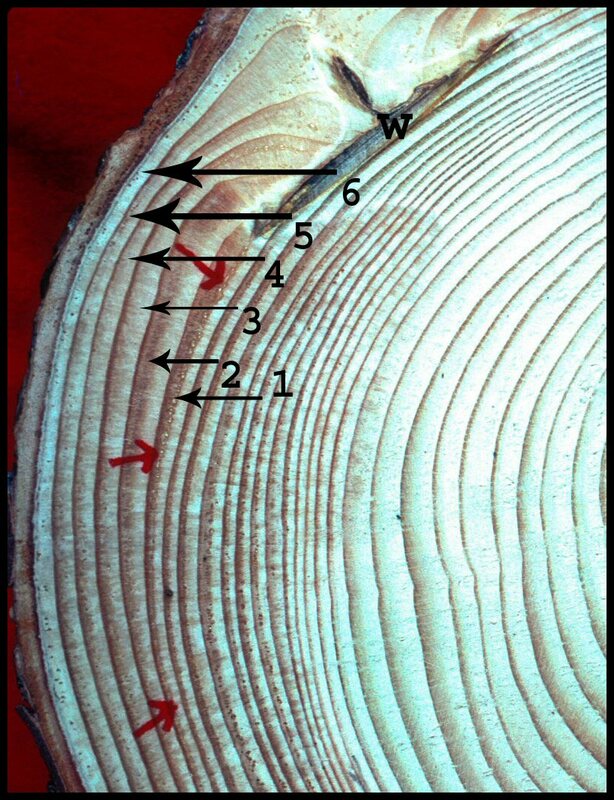 Here you can see that size of the column - above arrow and bottom arrow - is the age or size of the tree when it received a severe wound. 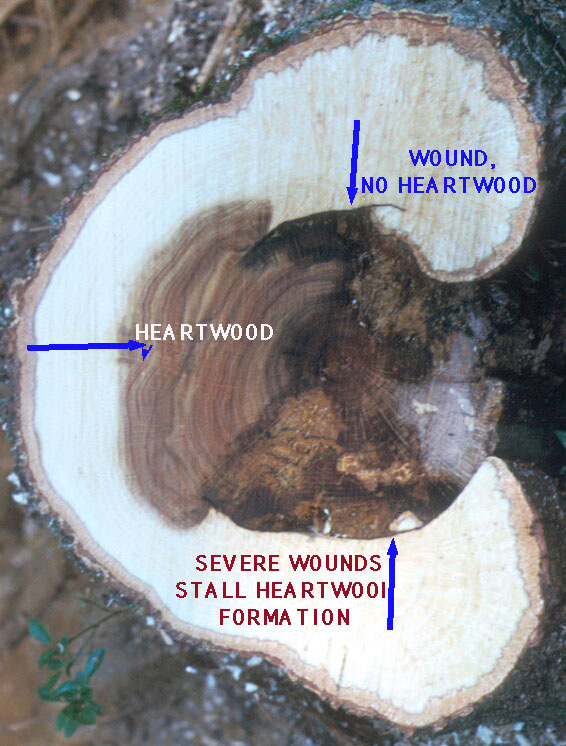 Dating wounds with heartwood forming trees. Here is a good sample to explain a way of dating wounds. 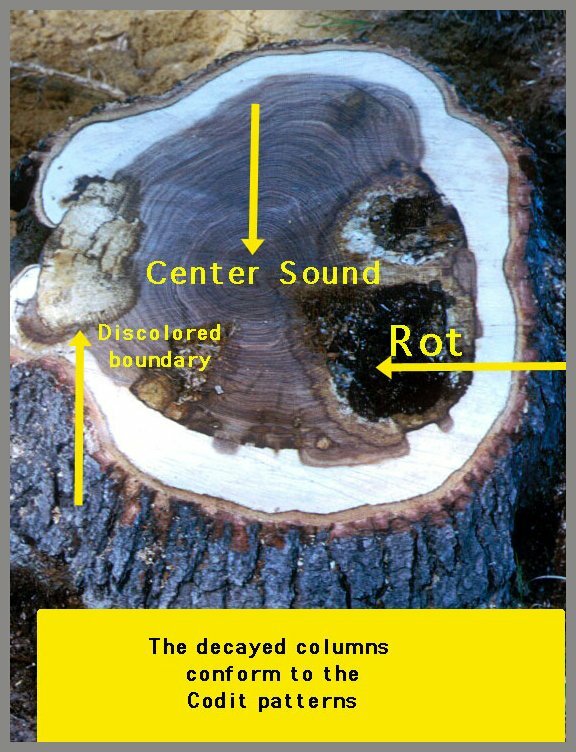 You would go to the opposite side of the wound (other side of the pith) and look for the barrier zone in the sound heartwood. Then count the increments of growth outwards towards the cambium zone. This picture also shows the so-called heartrot concept does not make sense.